Hybrids the only segment where mileage dropped. The mileage of the average diesel -- like this Porsche Cayenne diesel -- rose almost 10 mpg since 2008, according to a new study. After years of little growth, the fuel economy of the typical new car sold in the U.S. is now rising rapidly, according to a new study that found that new vehicles are getting an average 14% better mileage than just four years ago. For all 2012 light-duty vehicles. including cars, pickup trucks, minivans, vans and SUVs, the average miles per gallon is 21.5, compared to 18.9 mpg for model year 2008 vehicles, according to a new study by the University of Michigan. The averages were 21.2 for 2011, 20.7 for 2010 and 19 for 2009, the study said. That figure is an average of all the vehicles on the road but when weighted to reflect actual market demand, the shift away from large, gas-guzzling trucks to smaller, more efficient passenger cars and crossover, the shift is even more obvious, raising the average by another one to two miles per gallon. The typical car sold in 2011 got 22.5 mpg, up from 20.8 mpg as recently as 2008. “This implies that consumers tend to choose vehicle models with better fuel economy than the average of all vehicles available,” said Brandon Schoettle of the University of Michigan’s Transportation Research Institute, or UMTRI. “The recent economic downturn, coupled with rising gas prices, has led to an increased interest in purchasing more fuel-efficient vehicles,” he added. Using data from the EPA, Schoettle and UMTRI colleague Michael Sivak also examined fuel economy changes by vehicle characteristics: cars vs. light trucks, vehicle class size, transmission type, number of engine cylinders, drive type, fuel type and hybrid vs. conventional vehicles. 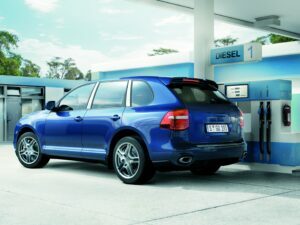 The U-M researchers found that fuel economy Improved 2.8 mpg for cars including station wagons, and 1.6 mpg for light trucks, including pickups, minivans, vans and sport utility vehicles from model year 2008 to model year 2012. Average fuel economy is currently 23.4 mpg for cars and 18.6 mpg for light trucks. A 3.8 mpg increase for compact cars, which had the second-highest average of 25.6 mpg. The smallest increases were 0.2 mpg for full-size vans, which had the lowest average 2012 rating of 13.4 mpg, and 0.4 mpg for small pickup trucks, which had the third-lowest average of 18.6 mpg. It also increased 2.5 mpg for vehicles with automatic transmissions and 2.8 mpg for vehicles with manual transmissions; 2.3 mpg for four-cylinder engines and 1.4 mpg for six-cylinder engines and 3.4 mpg for front-wheel drive vehicles and 2 mpg for four- or all-wheel drive vehicles from model year 2008 to model year 2012. Ironically, during the study found one anomaly in the trend towards better fuel economy. Mileage actually dropped 3 mpg for hybrids – though they are still more fuel-efficient overall than internal-combustion-only vehicles, according to the U-M study. This entry was posted on Tuesday, February 7th, 2012 at and is filed under Automobiles. You can follow any responses to this entry through the RSS 2.0 feed. Both comments and pings are currently closed. With the average mileage increasing in the conventional cars and decreasing in the hybrids, the gap between them shortens dangerously for the hybrids. Mazda actually says that using high compression ratio (14:1) and Miller cycle (late intake valve closing) their SkyActive-gasoline engines keep their good fuel economy at lower loads. cannot justify – any longer – the complexity and the additional cost of the Hybrids. The three of the above engines use a limited Miller cycle with throttle valve and high compression ratio (13:1 and 14:1) to improve the mileage at partial loads. The engine of the TwinAir (throttle-less) uses a normal compression ratio (10:1) and the MultiAir strategies of Fiat to achieve the same. The PatAir at http://www.pattakon.com/pattakonHydro.htm combines the two worlds: all the strategies / modes of Fiat MultiAir, throttle-less operation, unlimited Miller cycles and high compression ratio. With a gasoline engine keeping the good fuel economy at medium and light loads, who needs the hybrids?